Carbery is now out of action with a fractured wrist. 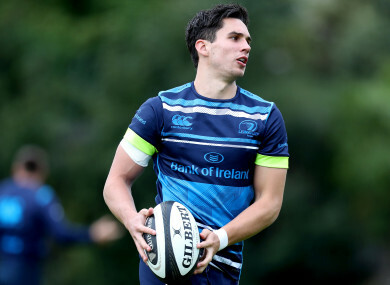 LEO CULLEN SAYS the exposure Joey Carbery is getting at fullback for Leinster is aiding the development of his overall game and there is no pressure from Irish management to use him at out-half. The Ireland head coach has repeatedly said he sees Carbery as a future out-half and it’s no secret he will need to be picked there on a weekly basis if he is to become the world class 10 he has the potential to be. The problem, however, is that Johnny Sexton remains the unmovable first-choice for both club and country, and Leinster have plenty of options at their disposal with Ross Byrne involved in every one of the province’s 10 games this season. Carbery came off the bench during Leinster’s final pre-season workout against Bath at 10, but has had to fill in at fullback because of an injury to Rob Kearney and has done a rather good job. It’s just the way things have panned out. But some quarters have this week suggested it would be beneficial for Carbery to leave Leinster and seek regular game time at another province with the 2019 World Cup very much the priority. It’s little surprise Cullen doesn’t agree. “There seems to be this narrative there in the background,” he says. “We’re lucky to have Joey and Ross Byrne and Cathal Marsh. Joey played 10 in pre-season, Rob Kearney picks up an injury as Joey’s coming back so then Joey plays 15 for us and Isa was playing in midfield because of injuries. That’s what squads rely on. “It’s interesting to see someone like Beauden Barrett who’s up for world player of the year and is probably one of the best players in the world. He’s played a lot of 15 and 10 and Joey in many ways is so similar to that type of profile. The exposure he gets at 15 is very good for his overall game whether he ends up at 10 or 15 we’ll have to wait and see. Email “'Do I feel pressure to start Joey at 10? No, there's no issues like that at all'”. Feedback on “'Do I feel pressure to start Joey at 10? No, there's no issues like that at all'”.